With over 30 years’ experience as an entertainer, Murray has led a career performing in every kind of venue from rural taverns to arenas, from harbors to mountain tops, even peppered with stints as a theater & television actor. Anyone who has seen him perform live knows that he brings the same intensity to every show, captivating audiences with a stage presence and flair that can only be delivered by a veteran artist. He strives to connect with his audience, making them feel as though they are part of the show. As well as having his own catalogue of music, he has also amassed a repertoire of over 150 songs which are a tribute to his favorite classic rock songwriters that he plays as if they were his own. Every performance is truly unique. If you’ve never seen one for yourself, check the calendar page for latest listings or click here for booking info. 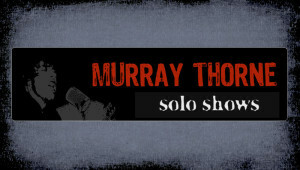 Murray Thorne © 2019. All Rights Reserved.